Bees and fish don't often have the occasion to meet, nor would they have much to say to each other if they did. 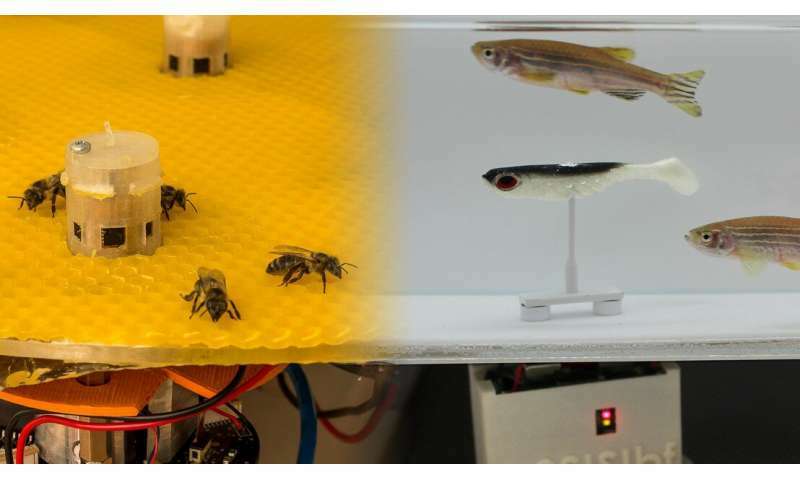 However, under the ASSISIbf project, engineers from EPFL and four other European universities were able to get groups of bees and fish to communicate with each other. The bees were located in Austria and the fish in Switzerland. Through robots, the two species transmitted signals back and forth to each other and gradually began coordinating their decisions. The study was published today in Science Robotics. "We created an unprecedented bridge between the two animal communities, enabling them to exchange some of their dynamics," says Frank Bonnet, a researcher at EPFL's Mobile Robots Group (MOBOTS), which is now part of the school's Biorobotics Laboratory (BioRob). Researchers at MOBOTS have designed robots that can blend into groups of animals and influence their behavior. They have tested their robots on communities of cockroaches, chicks and, more recently, fish – one of these "spy" robots was able to infiltrate a school of fish in a circular aquarium and get them to swim in a given direction. The robots within each group of animals emitted signals specific to that species. The robot in the school of fish emitted both visual signals – in terms of different shapes, colors and stripes – and behavioral signals – like accelerations, vibrations and tail movements. The robots in the bee colony emitted signals mainly in the form of vibrations, temperature variations and air movements. Both groups of animals responded to the signals; the fish started swimming in a given direction and the bees started swarming around just one of the terminals. The robots in the two groups recorded the dynamics of each group, exchanged that information with each other, and then translated the information received into signals appropriate for the corresponding species. During the experiment, the two animal species "talked" to each other even though they were some 700 kilometers apart. The conversation was chaotic in the beginning, but eventually led to a certain amount of coordination. After 25 minutes, the animal groups were synchronized – all the fish swam in a counterclockwise direction and all the bees had swarmed around one of the terminals. "The species even started adopting some of each other's characteristics. The bees became a little more restless and less likely to swarm together than usual, and the fish started to group together more than they usually would," says Bonnet. The study's findings could help robotics engineers develop an effective way for machines to capture and translate biological signals. And for biologists, the study could enable them to better understand animal behavior and how individuals within an ecosystem interact. Further out, the research could be used to develop methods for monitoring natural habitats by using animals' exceptional sensory capabilities. For instance, scientists could encourage birds to avoid airports and the related dangers or direct pollinators toward organic crops and away from crops with pesticides. Don't let them communicate! They'll eventually challenge us for alpha-species status if they learn too much. Someday when we're slaves to our fishbee overlords, you'll be sorry.